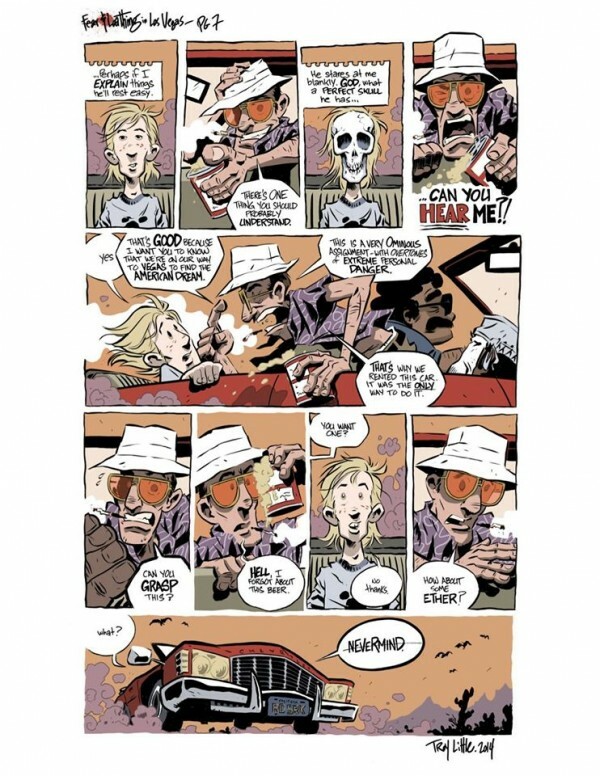 This finally got announced at Comicon in San Diego: PEI-based comics/animation pro, Troy Little (co-creator of cult-fave Angora Napkin and arguably the holder of the title: Most tiny leaves ever drawn in an episode of Franklin the Turtle) will be adapting Hunter S. Thompson’s Fear and Loathing in Las Vegas as a graphic novel for IDW. Here’s one of the pages from his pitch. There’s so much I could get into here, about how Troy has always been a guy who plugs away at his own projects, and how that has steered his career beyond the realm of “layout artist 317” on Franklin. I could take this opportunity to hold him up as an example of how, despite obstacles and hardship, a self-directed career can pay off. But maybe I’ll save that for another time. Congratulations Troy. You earned this, and you’re going to kill it. This entry was posted on Saturday, July 26th, 2014 at 9:06 am	and is filed under News. You can follow any responses to this entry through the RSS 2.0 feed.